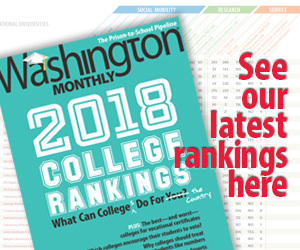 Washington Monthly | Wait, This is a Thing? You know that genre of righteous anger where what immediately follows is shame that you were naive enough to get angry about the thing in question, that you weren’t jaded enough to understand that That’s Just How The World Is? The guns, some of which come in camouflage and desert khaki, bristle with features useful only to an infantry soldier or a special-forces operative. A flash suppressor on the end of a barrel makes it possible to shoot at night without a blinding flare. Quick-change magazines let troops reload easily. Barrel shrouds allow precise control without fear of burns from a muzzle that grows hot after multiple rounds are fired. But now anyone can own these guns, and millions are in civilian hands. Madison Avenue meets gun culture. Results are ugly.